Back of Beyond Baking: Good Mummy award baking. It's the first day of the summer term and it is raining here in the back of beyond. Of course it's raining it's time to do the school run, it is a fact that if it is going to rain on any given day it will rain between 8.30 and 9am or at 3pm. Ask any parent with school age children and they will confirm this. So it's raining and I know I mustn't complain because we are in a drought and we need the water. Our farmer will be particularly pleased as he has now moved onto ploughing and planting as the lambing season is nearly over (I was informed yesterday that there are only 3 expectant ewes left and the farmer is fed up of waiting for them to drop). We have also started planting in our little corner of back of beyond. I say "we" but it's loosely based as I kind of say "isn't it time to start planting" to Mr Vander-Cave and he goes out and starts planting whatever seeds and bulbs have taken my fancy from the on line seed and plant nursery. I don't generally allow my hands to get too dirty, but I'm more than happy to reap the rewards. Thankfully due to the milder winter my rocket and herbs have survived and I am already using them in salads and sauces. As it is the first day back and I am feeling a little guilty (as Master Vander-Cave's lunch box is missing a home baked cake) I decided to make something for when he arrived home. 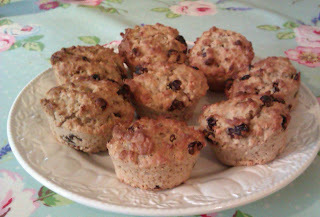 I am still striving to keep to a low fat health conscious diet so I dipped back into my healthy muffin book and came up with raisin oat muffins, only 166 cals and almost no fat. I have tweaked the recipe slightly with the addition of some warm spices which lend themselves to the main ingredients as without fat they need good flavouring! This recipe also gave me the chance to use my amazing new silicone muffin pan again. I have to say I don't know how I lived the first 30ish years of my life without it. I have used it for muffins, low fat Yorkshire puddings and as an extra cupcake tray. Well worth the investment! The other great thing about this recipe is it is so easy and quick to make which is a necessity for me currently. By 2.30pm I have a lovely batch of muffins in the oven and time to put my feet up before completing the other half of the school run. When I jumped in my car at a little after 3pm I thought I had the day under control. What a fool I was! As I turned out into the road I was faced with approximately 100 grumpy looking sheep filling the lane ahead of me, no sign of a farmer or anybody else being in control of the herd. A quick three point turn whilst the sheep were coming menacingly close I was anxious that they thought I was the sheep dog) and I had to head off on the long back lanes route to school. Clearly someone was looking after me today. As I drove like the wind along the windy roads I didn't meet any other traffic and when I pulled up at school late, the teaching staff were running late too! Master Vander-Cave was enthusiastic in his praise of these muffins and has asked for one in his lunch box tomorrow. And apparently I am "the best baking mummy in the world ever". That's all the thanks I will ever need! Pre heat oven to 190c and lightly grease 10 muffins cups in a muffin pan. In a large bowl stir together the flour, oats, sugar, baking powder, cinnamon, nutmeg and salt until well mixed. In a jug combine the milk, egg whites, oil and vanilla. Beat together slightly. Make a well in the centre of the dry ingredients, add the milk mixture and stir to just combine. Quickly stir in the raisins. Spoon mixture into muffin cups and bake for 16 minutes until risen and brown.